Nowadays, many people have started to take part in regular workouts and consume healthy meals because they know about the importance of health and fitness. But the ever-busy work schedule and the lack of time often prevent us from making healthy and tasty food at home. Therefore, people often seek for a simple but healthy diet plan which is high in fiber, protein and vitamins as well. 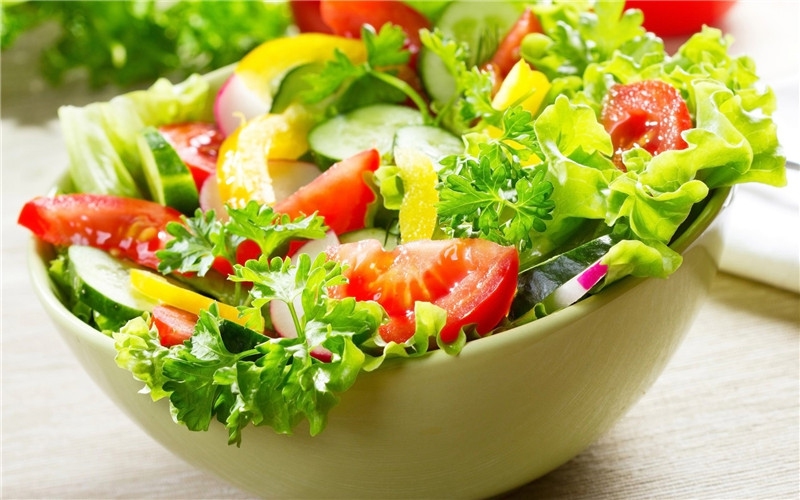 With some healthy vegetarian salad recipes, you can provide many nutrients to the body. Here are a few of the healthy vegetarian salad recipes, which are extremely wholesome and delicious. Appcat salad is an easy vegetarian salad recipe. It consists of the goodness of fresh and colorful vegetables high in beta-carotene, minerals, fiber and vitamins that are essential for managing weight. Bean sprouts in this recipe are one of the greatest vegetarian sources of protein. Sunflower oil – 2 tbsp. Sesame oil – ½ tsp. Reduced-salt soy sauce – ½ tsp. Grated fresh ginger – 1 tsp. Take the celery and carrot and cut them into thin matchstick-sized pieces. Core an apple and chop it. In a mixing bowl, combine the carrot, apple, celery, bean sprouts, sunflower kernels and sprouts. For dressing, you whisk together all of these ingredients and season with pepper. Then, combine the dressing with the salad and toss well. Finally, enjoy it. This vegetarian salad recipe is packed with potassium, calcium, and vitamin C. You can serve it alongside crackers and a simple vegetable soup. Almond flakes – 1 tsp. Firstly, prepare a smooth dressing by whisking the lemon juice with pepper powder and honey. Soak orange slices in the honey and later refrigerate for around 1.5 hours. Remove it from the fridge and toss with banana slices. Then, spoon in that dressing atop this fruit mixture and toss well. Line a serving plate with mixed salad greens and transfer to the plate. Scatter almond flakes atop the salad and immediately serve. This vegetarian salad recipe is loaded with healthy vitamins, antioxidants, and minerals. Broccoli is full of vitamins A, B2, C and K along with folate, fiber, pantothenic acid, phosphorus, chromium, potassium and manganese that are extremely needed for overall health. Chickpeas in this salad are high in fiber and protein, which help to control your hunger. This potent combination is useful for weight loss promotion in a healthy way. Simply, in a bowl, mix the crumbled cheese, lemon juice, yogurt, garlic and pepper. Add chickpeas, broccoli, bell pepper to it and mix them well. Finally, serve chilled or at room temperature. This salad is also easy to prepare and is full of nutritious ingredients such as olive oil, quinoa, bell peppers, cucumbers and tomatoes. Quinoa is an awesome substitute for rice and is also rich in protein. It contains no gluten and is loaded with folate, minerals, and fiber as well. Being rich in fiber, quinoa is one of the best options for weight watchers since it helps to enhance satiety and prevent the craving for bad foods. Olive oil present in this recipe has lots of benefits for the body as well as overall health. It is also high in essential fatty acids. Chopped parsley – 1 tbsp. Chopped mint leaves – 1 tbsp. Extra virgin olive oil – 2 tbsp. Firstly, in a saucepan, boil the water and to it, add 1/2 tsp of salt. Next, pour the quinoa and lower the heat to simmer. Then, cover the quinoa and now cook for 15 to 20 minutes till this water is absorbed. After that, take a baking tray and pour the quinoa in it. Evenly spread it so that this cools down. In a large bowl, mix the garlic, lemon juice, pepper and remaining salt & the cooled quinoa together with the bell pepper, tofu, tomatoes, cucumber, parsley and mint. Finally, toss well and serve. This healthy salads recipe is made from the cabbage, yogurt and carrots. Surprisingly, cabbage is actually an ideal vegetable for weight loss because this vegetable has just 33 calories a cup. Besides, low-fat yogurt is full of protein that is necessary for cell growth, muscle building and tissue repair. Chopped parsley – 4 tbsp. In a large bowl, mix the cabbage, onions and carrot. Stir the yogurt afterward and season with pepper. Next, dress it onto that cabbage mixture and then, toss well. Top it with the radishes, parsley and peanuts prior to serving. Serve immediately. These amazing healthy and tasty vegetarian salad recipes will give you all the needed nutrition and give various flavors to relish and enjoy as well. Try these healthy vegetarian salad recipes and don’t forget to share your feedback. This guest post is by Nina Nguyen, a blogger with many years of experience on searching the best natural home remedies for beauty and health issues. Server responsed at: 04/25/2019 10:20 p.m.